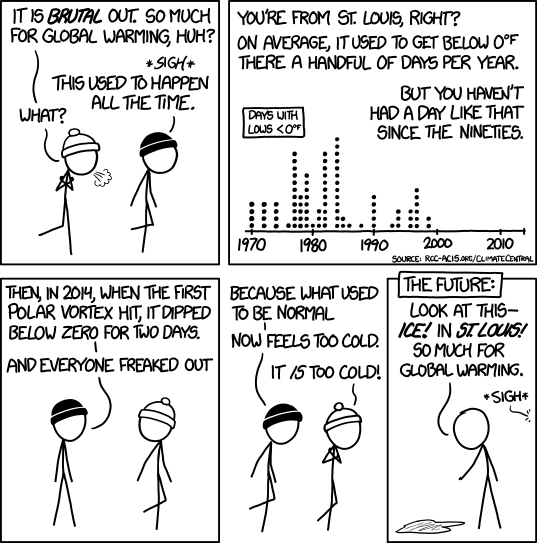 It causes me to sigh and roll my eyes when I hear people try to use the first two cold snaps of the year as proof that Global Warming is a left-wing hoax. Last year was the fourth warmest year ever recorded. All of the top 10 warmest years on record have occurred since 1998. According to publications on NASA’s website, ninety-seven percent of climate scientists agree that climate-warming trends over the past century are very likely due to human activity and most of the leading scientific organizations worldwide have issued public statements endorsing this position.